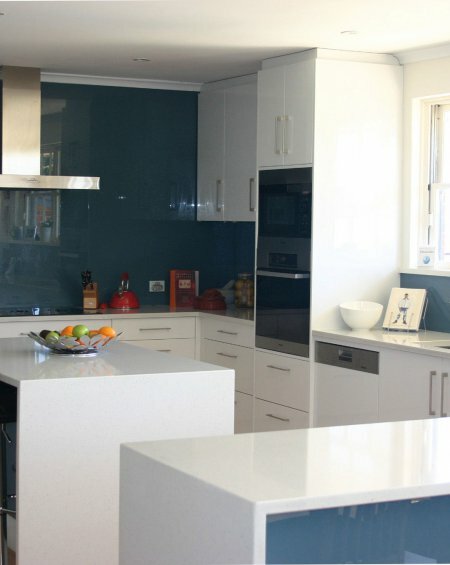 Kewco Glass Splashbacks offer a pristine look that will enhance any kitchen. Imagine having no grout where bacteria can form. The low maintenance easy to clean splashbacks have flat polished edges and they are waterproof, high impact, heat resistant and come in an endless choice of colours including metallic (ask for the latest colour chart). Kewco use either clear or low iron 6mm toughened glass for safety and to comply with Australian Standards. Clear glass when painted white will give off a soft aqua colour. Low Iron Glass is a high quality ultra clear glass and highlights any colour in its natural colour scheme, increasing the colour depth with its glossy surface. A quote can be given for your splashbacks from your kitchen plan and measurements will be taken once all your bench tops are in place. Come into our showroom or contact our friendly sales team for more information.